Today’s pressing political, social, economic, and environmental crises urgently ask for effective policy responses and fundamental transitions towards sustainability supported by a sound knowledge base and developed in collaboration between all stakeholders. This book explores how action research forms a valuable methodology for producing such collaborative knowledge and action. 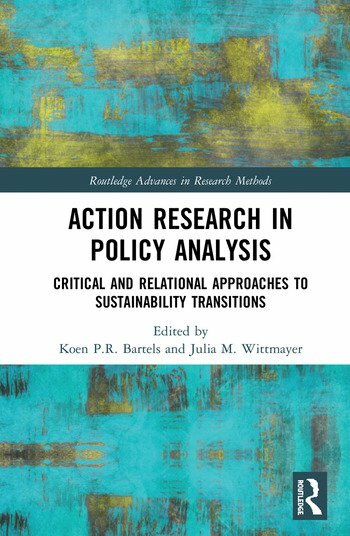 It outlines the recent uptake of action research in policy analysis and transition research and develops a distinct and novel approach that is both critical and relational. By sharing action research experiences in a variety of settings, the book seeks to explicate ambitions, challenges, and practices involved with fostering policy changes and sustainability transitions. As such it provides crucial guidance and encouragement for future action research in policy analysis and transition research. This text will be of key interest to scholars and students of policy analysis and transition research and more broadly to public administration and policy, urban and regional studies, political science, research and innovation, sustainability science, and science and technology studies. It will also speak to practitioners, policymakers and philanthropic funders aiming to engage in or fund action research. Koen P.R. Bartels is Lecturer in Management Studies at Bangor University, UK, where he teaches courses in public administration and qualitative research. He has published in leading journals, including Urban Studies, Environment and Planning C, Public Administration, Public Administration Review, and International Journal of Urban and Regional Research, as well as a book Communicative Capacity (2015). Julia M. Wittmayer works at the Dutch Research Institute for Transitions, Erasmus University Rotterdam, The Netherlands. With a background in anthropology, she is interested in roles of and social relations and interactions between actors in sustainability transitions (governance).